Meet Greta (right) and Gwendolyn (left): two variations on what is essentially the same style, with a studded footbed leading to a matching bow. Whereas Gwendolyn has a high platform and super-slim stiletto heel, however, her sister Greta is just a little more conservative (although I don’t think “conservative” is the right word for studded pink stilettos somehow…), with a smaller, covered platform, and a slightly thicker heel. 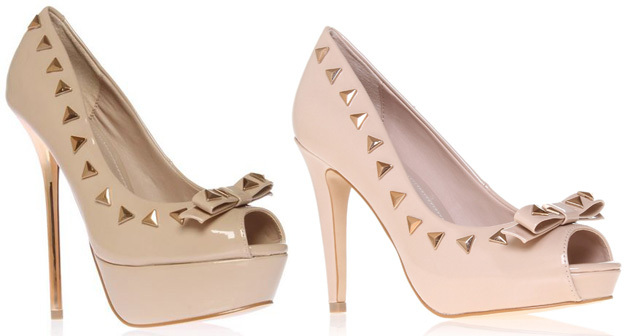 Two different shoes, but with much the same look – oh, and both of them remind me of Valentino, thanks to the studded bow. These are £120 per pair, and Gwendolyn is also available in black. I think I like Greta a tiny bit more. But I adore them both. I think I could definitely find room for both on my shelves – Greta for work and Gwendolyn for party time! They’re both lovely!